Lake Solitude is a high-alpine gem that is often bustling with people coming to marvel at its unprecedented beauty. You can cut it short by 4 miles if you take a boat across Jenny Lake. If you hike or run to Lake Solitude expecting solitude, you’ll be sorely disappointed. 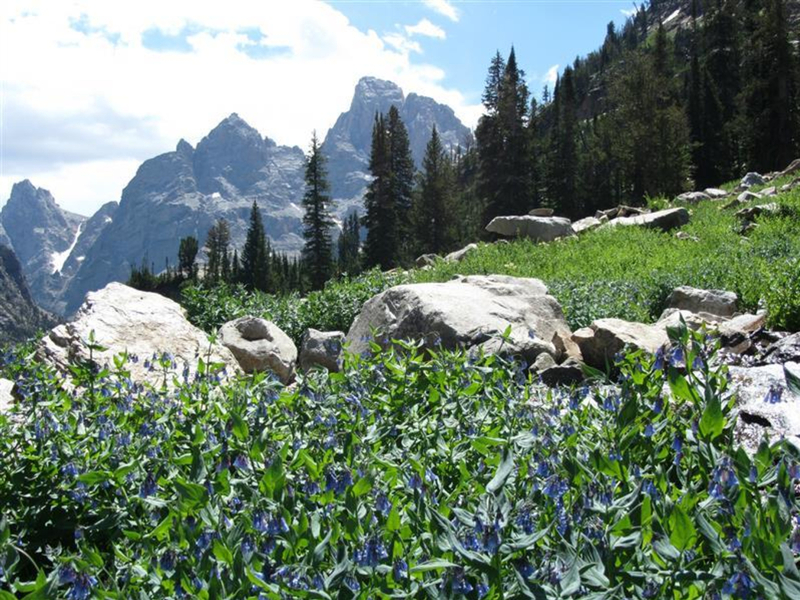 If you go knowing it’s the most popular longer day hike in Grand Teton National Park and you’ll share the trail and lakeshore with dozens of other hikers, you won’t get annoyed and should be able to enjoy Lake Solitude’s high alpine beauty. Lake Solitude is fairly big for a high alpine lake. It’s set at the back of the North Fork of Cascade Canyon, with (crumbly) rock walls surrounding it on three sides. To the north, you can hike the 2.1 miles up to Paintbrush Divide and drop into Paintbrush Canyon. That’s the only other trail heading out of Cascade unless you backtrack the 3-some miles to the canyon’s fork. There’s a lovely trail up the South Fork of Cascade that takes you up and over Hurricane Pass, which you can then drop down into Alaska Basin from. But this is about Lake Solitude, a very worthy destination for an over-night or day hike from Jenny Lake. As far as the park’s high lakes go, this one is relatively easy to get to. If you take the ferry across Jenny Lake to the mouth of Cascade Canyon, that cuts about 2 miles off the hike. Still from the west shore boat dock to Lake Solitude and back, it’s 16-some miles. Over that 16-some miles though, you only gain (and then descend) 2,500 vertical feet. For comparison, the hike to Surprise and Amphitheater lakes, from the Lupine Meadows trailhead, climbs/descends 3,000-some feet over its 8-mile r/t length. 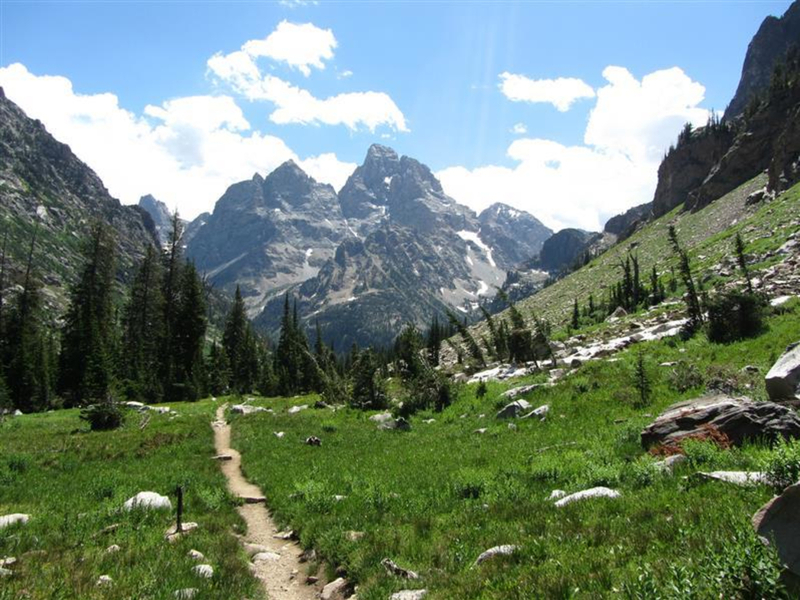 Once you get above Inspiration Point, which overlooks Jenny Lake, and into Cascade Canyon proper, the trail is fairly flat for 4-5 miles. About a mile above the canyon’s fork, the trail begins climbing more steeply. At that point, tight pine forests have given way to willows and other bushes and the canyon has opened up. 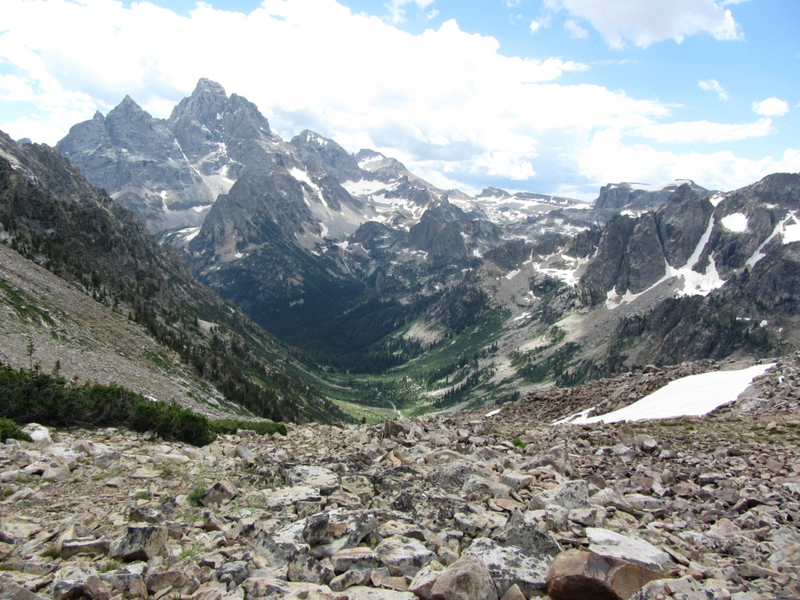 It’s around this point that, if you turn around and look back down the canyon, you get some of the most jaw-dropping close-up views of the major Teton peaks. Moose also like this bushy area. 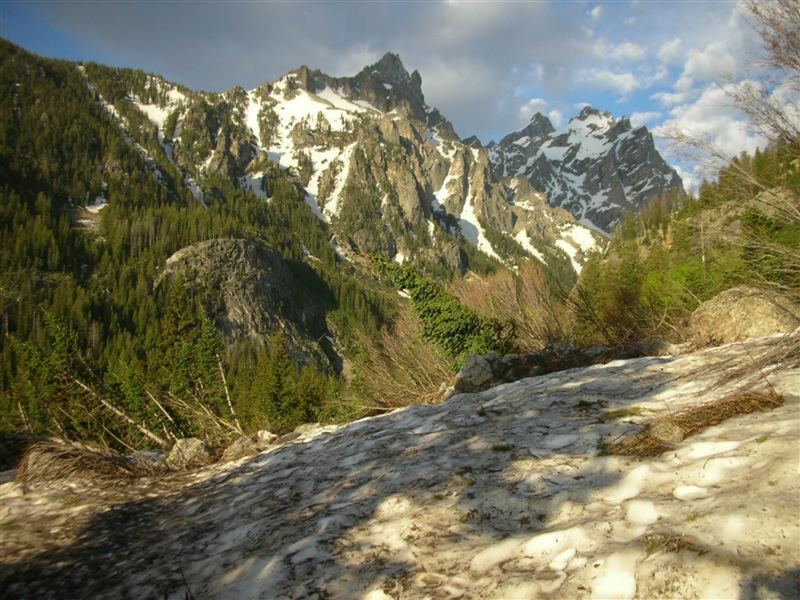 It is in this area that the North Fork of Cascade Canyon camping zone is. There is plentiful water here all summer long. Camping at Lake Solitude itself is not allowed. Warning: If you do this as a day hike and are looking to take the return ferry across Jenny Lake, make sure you know when the last departure from the west shore boat dock is. The two mile hike around Jenny Lake the ferry cuts off is not difficult, but if you’re hiking it because you missed the last ferry, it’ll feel like the longest/hardest 2 miles in the world. If you want to hike this lake section by choice, they’re quite scenic. The trail gently undulates as it hugs the shoreline. In a couple of spots, the trail is right against the lake. But it’s not so scenic it’s worth missing Lake Solitude for. If you’re on the fence about your ability to make it to Lake Solitude and back; please avail yourself of the ferry. 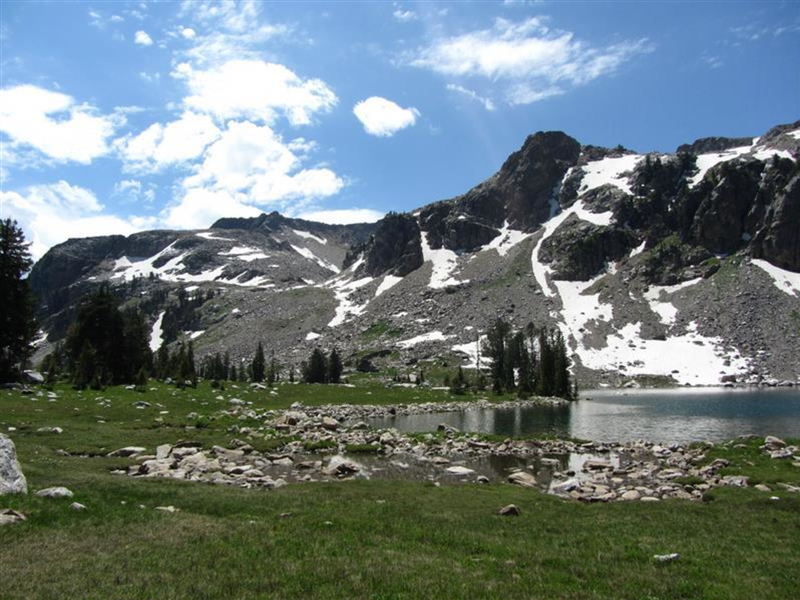 Those looking for a strenuous day hike or an overnight trip to an alpine lake. Take the ferry across Jenny Lake to the mouth of Cascade Canyon and hike from the west boat dock. Camping at Lake Solitude is not allowed.